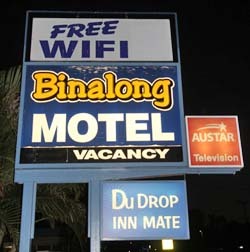 The Binalong Motel is a short 5 minute walk from the CBD making it a quiet, peaceful place to rest. Goondiwindi is on the MacIntyre River in Queensland near the New South Wales border, 350 kilometres (220 mi) south west of the Queensland state capital, Brisbane. The twin town of Boggabilla is nearby, on the New South Wales side of the border. Most of the area surrounding the town is farmland and is renowned for its wheat, cotton, beef and wool. The town is a major transport nexus between the southern states and Queensland. The Newell, Leichhardt, Gore, Cunningham, Barwon and Bruxner Highways all merge at Goondiwindi or close by.